"In southern Africa the Sasol eBirds would undoubtedly be my first choice. The text is detailed, the navigation system is user friendly and the opportunity to listen to recordings of calls and songs is a huge asset. 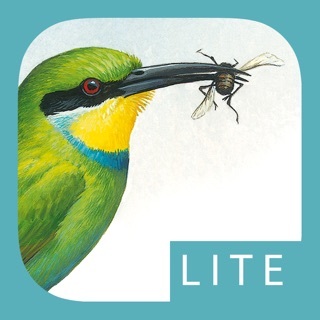 Above all, the superb paintings by Norman Arlott and Peter Hayman have stood the test of time and are more detailed, more accurate and more life-like than anything on offer in other birding apps for the region.” — Mark Cocker, author of Birds and People. 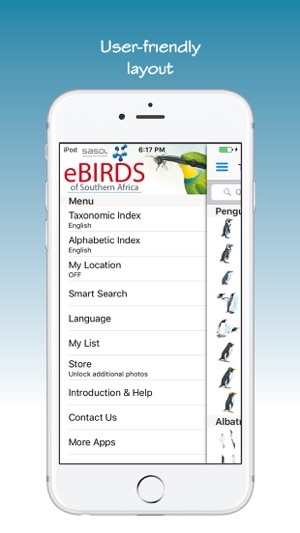 The Sasol eBirds of Southern Africa is an interactive version of the best-selling Sasol Birds of Southern Africa field guide (4th Edition). 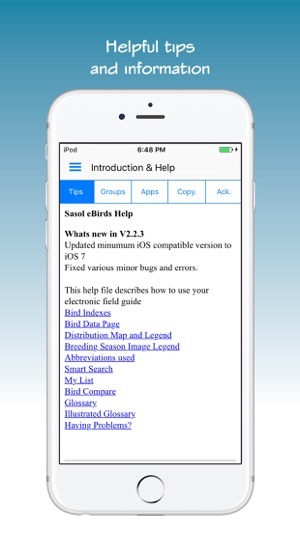 This app has specific features that will enhance your birding experience. 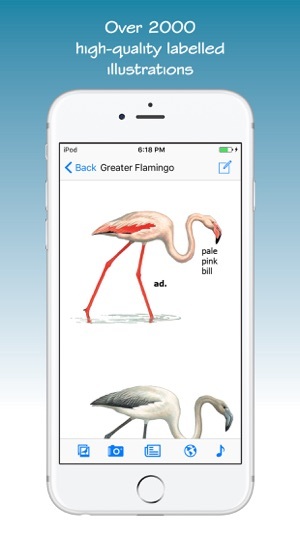 ● Swipe to move to the next or previous species. ● 969 Species found in the Southern African region and includes images, distribution maps and text descriptions. ● Over 2800 photographs for 833 species (additional in-app purchase required). 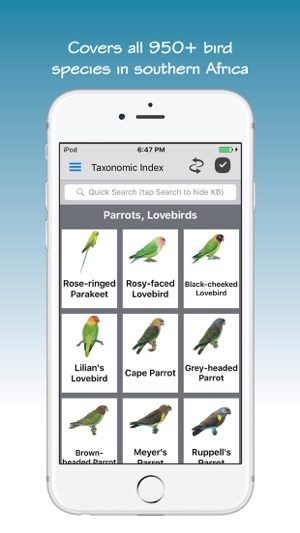 ● A “Smart Search” that allows you to easily identify a bird using beak shape, bird size, bird colour and habitat. 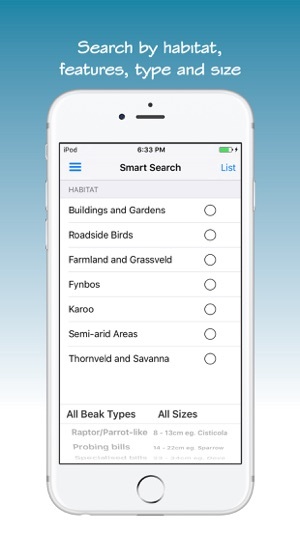 ● You can select a region of Southern Africa, so that the lists of birds throughout the program display only the birds in your region. 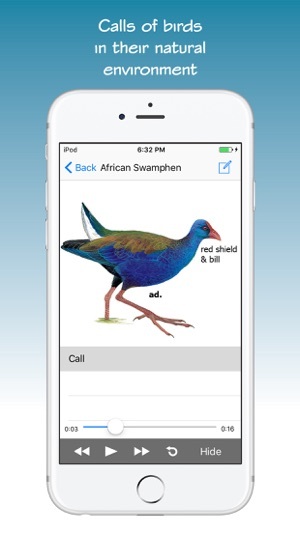 ● “Bird Compare” allows you to compare two birds side by side on the same screen (including calls, illustrations and photographs). 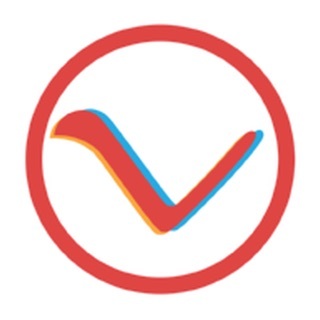 ● A personal bird list that stores your bird sightings saved to the device* and can be exported using email. 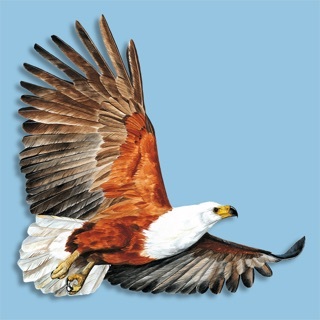 ● View the Bird Index by English, Afrikaans or Scientific bird names. *Uninstalling the app will result in the loss of your list. It is recommended that you keep your own backup (master list) separate from the program. NB. This Application WILL ONLY work on an iPhone or iPod Touch and iPad running iOS 7.1 or higher NOT A NORMAL IPOD CLASSIC/NANO. Fixed some layout issues on newer iPhone X devices. I love the app. I love the sounds and the info of each bird. It’s easy to use once you get the hang of it and the best is that it’s always with you when you need it. BUT it would be really great if the “My List” could have a picture of each bird next to the name. This way one could look through your list and show others too. My list (location) does not work. I have the app on my iPhone 6 (updated) and every time I try to go into my location list it throughs me totally out of the app so I can’t see my location list. I have contacted Sasol ebirds - no solution yet. Love the App, please add the picture of the birds to my list.